Firefighters were called out to three large farm fires in last week, prompting warnings from fire chiefs. Seven dogs and 30 pigs were rescued in Enfield when two barns full of hay bales set alight on Wednesday evening (April 15). It is believed the fire was started by hot cutting work taking place close to the hay bales, which then helped the fire to spread. Six fire engines were called to tackle the blaze which spread across a number of farm buildings and a flat bed lorry. In County Antrim, more than 50 cows were saved when a fire started in a barn housing about 1,000 bales of hay on Sunday (April 19). Sheep were rescued on Sunday (April 19) when a fire broke out in a straw barn in Derbyshire. Fire officers said many fires occur accidentally in the spring and summer due to rising temperatures and drier weather, making hay and straw more liable to catch alight. 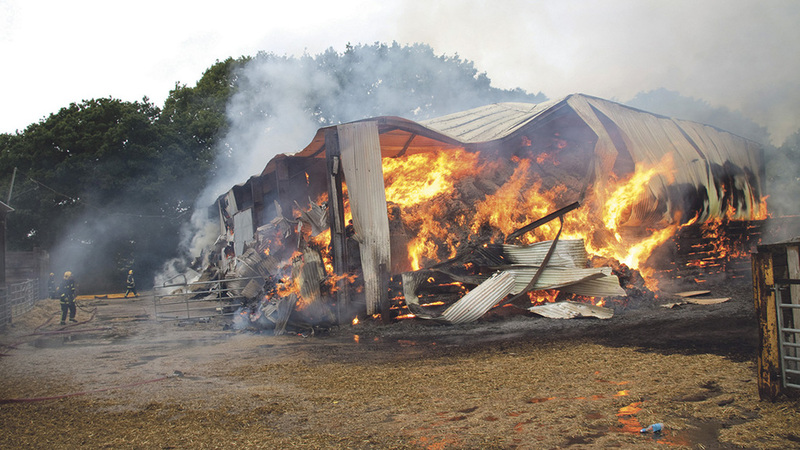 However, August 2014 saw 25 farm fires in the space of five weeks in Shropshire caused by machinery faults and arson, as well as spontaneous combustion due to the hot weather.